This ode to Neapolitan pizza comes from Peppe Miele, president of VPN Americas, the North-America branch of the Associazione Verace Pizza Napoletana (AVPN), the non-profit organization founded in Naples in 1984 by a group of 17 pizza chefs to safeguard the tradition and promote the culinary art of authentic Neapolitan pizza. To this end, AVPN established a set of rules laid out in a “Disciplinare” explaining in detail the required elements to produce authentic Neapolitan pizza; it also provides training courses with AVPN-certified master pizzaioli teaching the art of making Neapolitan pizza. In the U.S., these courses are held at the association’s school in Marina del Rey, Calif.
Intrigued by the idea of a Neapolitan pizza training school in a California beach town, I decided to pay a visit to witness a lesson first-hand and interview Peppe Miele. Miele, who moved from Naples to California in 1981, explained that when he introduced Neapolitan pizza in his restaurant Antica Pizzeria, the first in the U.S. to be certified by AVPN, he had a hard time making the concept of Neapolitan pizza understood. The pizza tradition brought to the U.S. by Italian immigrants had been completely lost by then and pizza meant only "American pizza"; compared to it, the original Neapolitan version, with its simple ingredients, looked "poor". His clients did not believe that was the "real pizza", and were certainly not familiar with a wood-burning oven. Things have changed since then and Neapolitan pizza is now in high demand, with the U.S. becoming the biggest growing market. The number of people attending a professional course at the school has also steadily increased. Today, many of the students take the course with the idea of opening a pizzeria, while a few years ago they came with the intention of adding a pizzeria to an existing restaurant. There are now 69 certified pizzerias in the U.S. displaying the VPN logo, which depicts Pulcinella, the famous character associated with Neapolitan puppetry, holding a pizza peel. It is the largest number of members outside Italy and the association expects to enroll 20 new members in 2014 with at least 100 trainees. In order to be able to display the logo and maintain it through the years - inspections are carried out periodically – the rules of the “Disciplinare” must strictly be adhered to. The regulations include very specific details about ingredients and recommended amounts, production technique, characteristics of the dough, toppings and required equipment. “Pizza has solely Neapolitan origins and the many variants made everywhere else are nothing but interpretations of a recipe that is deeply linked to the traditions and culture of the city of Naples,” Antonio Pace, president of AVPN, has said. Before the hands-on training began, the course provided a brief history of pizza. So my course mates heard that there is no doubt about the fact that the first version of a pizza - the union of the crust with other ingredients like olive oil and tomato - appeared in Naples more than 300 years ago. Before Pizza Margherita, there were Pizza Mastunicola (lard, cheese, pepper and basil) in 1660, Pizza Marinara (tomato, garlic, oregano and oil) in 1750, Pizza with Mozzarella in 1850 followed by the basil variant in 1871. The official date for the birth of the Pizza Margherita is 1889, as it was created for Queen Margherita, wife of the first King of Italy, Umberto I, when the Italian royals visited Naples. 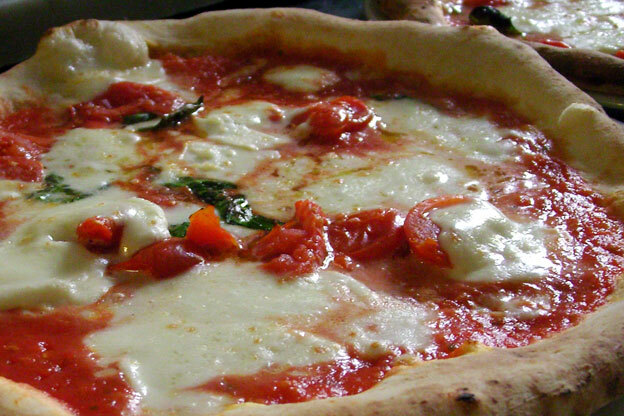 The world's first pizzeria opened in Naples in 1830, Antica Pizzeria Port’Alba. So what does it take to make authentic Neapolitan pizza? After a bit of history, I proceeded to the counter where master pizzaiolo José Barrios was ready to show how to prepare the dough. The dough is made with just four ingredients: water, salt, yeast and flour, and is left to rise at least eight hours. Now, the tricky part comes when working the dough. 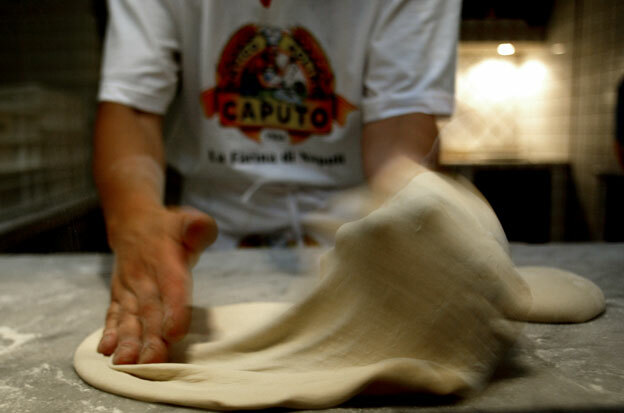 It is always best to prepare it on a marble or granite counter, Barrios explained as he kneaded and stretched the dough – exclusively by hand (another rule set by the AVPN “Disciplinare”), just as our best pizzaioli would do in Italy. Ingredients for the topping are also very simple and should preferably be from Campania, or from the list of AVPN’s approved suppliers: peeled tomato should never be crushed in a blender, but rather using a food mill; buffalo mozzarella or fior di latte should be spread uniformly on the pizza, extra virgin olive oil must be poured with a spiral motion and basil should be added at the end. 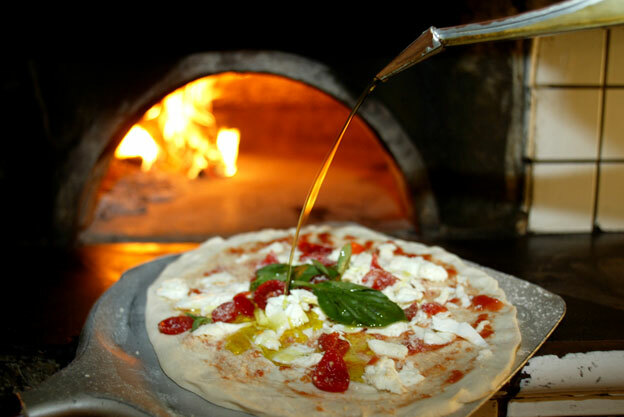 The pizza must then be cooked in a wood-fire oven between 60 and 90 seconds. And that’s not even all: the crust (1-2 cm high), the look (round, with a diameter no greater than 35 cm), the aroma (intense smell of baked bread), the flavor (balanced, blending well all the ingredients) are all essential to determining the quality of a good Neapolitan pizza. And, as I tasted a delicious, just-out-of-the-oven Neapolitan pizza thousands of miles from where pizza was invented, I truly felt transported back to the alleys of Naples.